Today’s high-tech digital engines allow higher speeds and lower fuel burn. 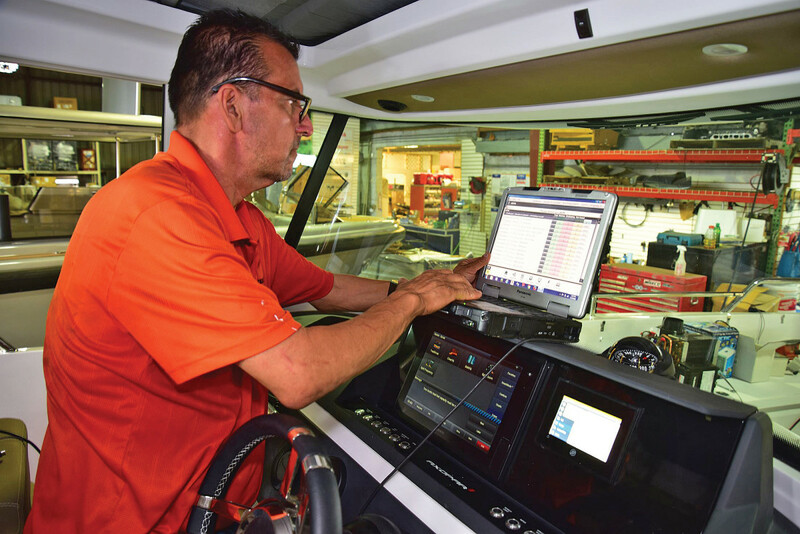 Swapping out old outboards isn’t as simple as you may think, but it’s worth the effort and expense to upgrade to high-tech digital motors. Father Time has no mercy. He wields his scythe and eventually everything, animate or inanimate, gives up the ghost. Your generous maiden aunt, your favorite dog, even your outboard motor—all tend to expire at the worst possible time. Nothing you can do about the first two, but the third? Totally under your control. Swap your middle-aged outboards while they’re still firing on all cylinders. You won’t be buying just new engines, you’ll get new technology, too. Mercury’s 200 FourStrokes are lighter than most V-6s, but at 475 pounds they’re still a handful to hang on the transom. 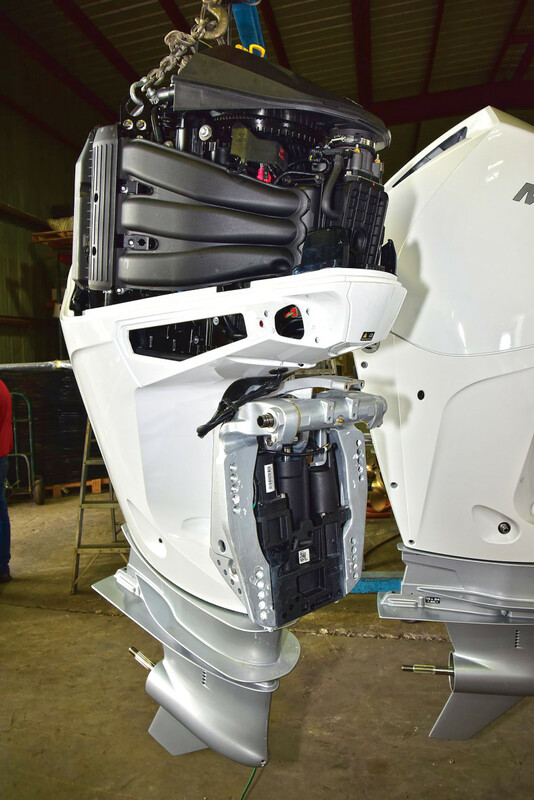 In the past decade, outboards have gone high-tech. They have digital brains under the cowling, digital controls at the helm, active throttle adjustment and auto trim for skippers sick of fiddling with rocker switches. They’re fuel-efficient, less polluting and ultra-reliable. Repower now, especially if you add a few extra horses, and your boat will be faster and burn less fuel. 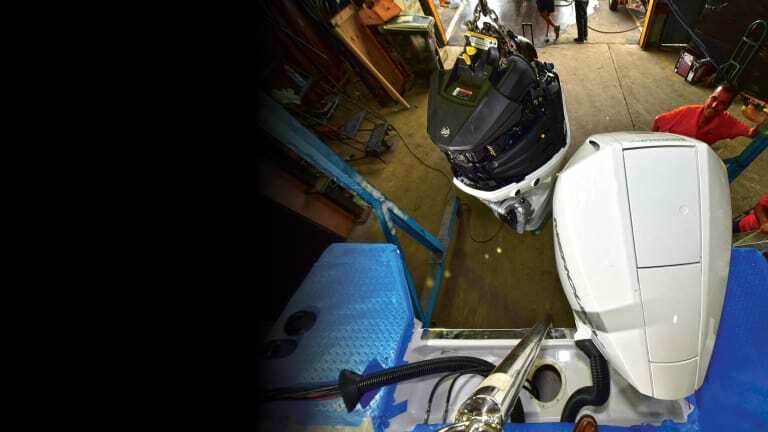 However, there is reason to approach a repower with caution: Swapping outboards may seem like an easy deal—unbolt the old, bolt on the new, hook ’em up and go—but most of the time there’s a lot more to it, at least if you want to get the most out of digital motors and protect your investment at the same time. A template makes drilling the holes in the exact pattern an easy job. All major motor manufacturers use the same pattern. When is it time to repower? 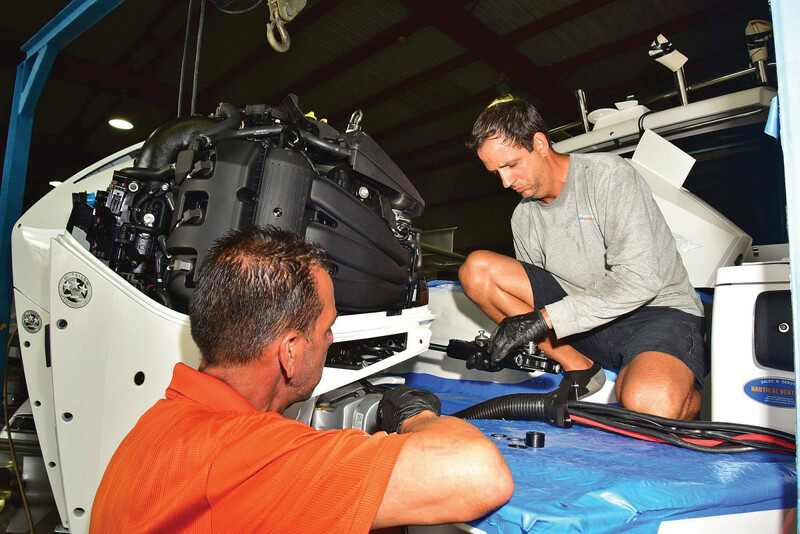 Mike Praolini, service manager and repower expert at Nautical Ventures, a boat/motor dealership and service facility in South Florida, said he’s seen plenty of four-stroke outboards with 2,000 hours on the meter, and some super-well-maintained motors with nearly 5,000 hours. 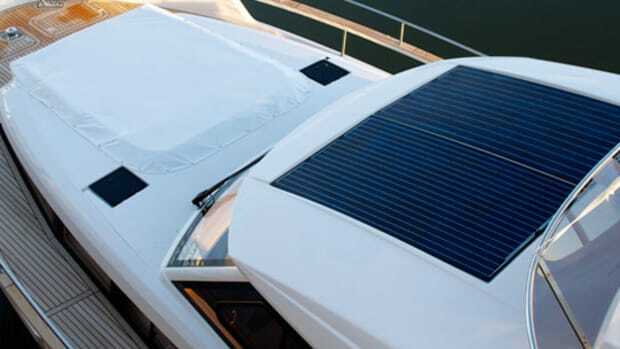 Nevertheless, some Nautical Ventures customers change their motors when the warranties run out, so they’re always covered. (Motor manufacturers love those guys!) That’s new motors every four or five years, on average, while they’re still attractive as trade-ins. 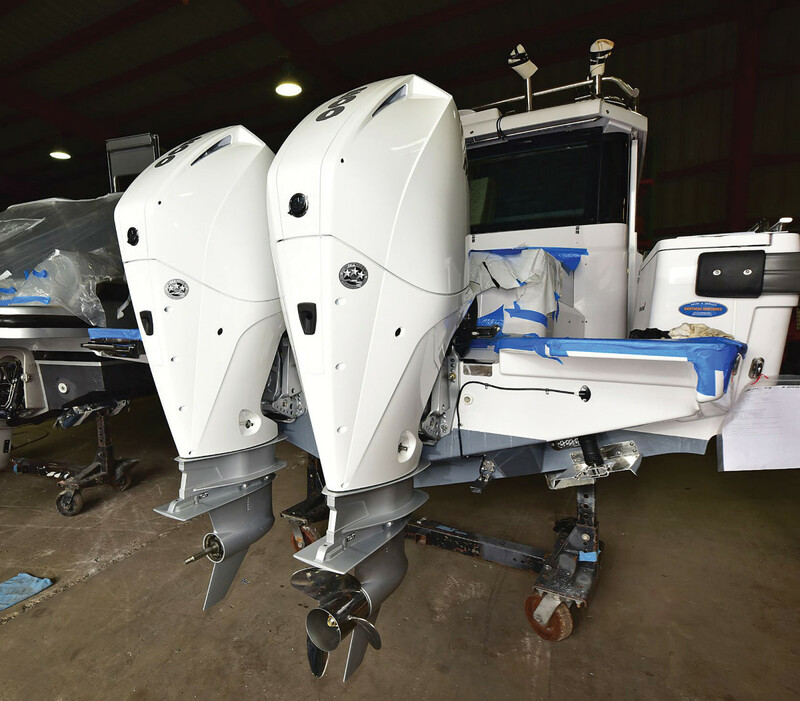 The market is strong for late-model, well-maintained used outboards, Praolini said. Swapping outboards while they’re still in their prime costs a few bucks, but saves on repairs and adds peace of mind. 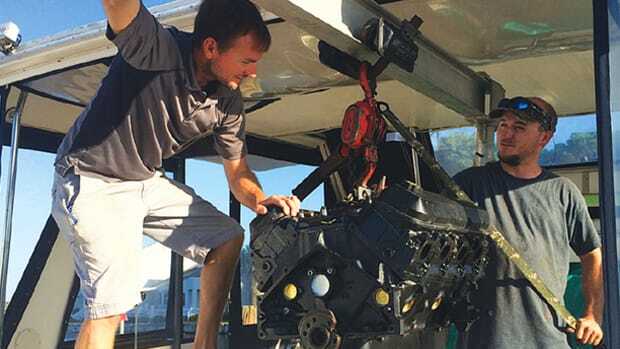 Plenty of people do it with cars, so why not outboards, too? Even if an outboard can last 2,000 hours, does that mean you should keep yours that long? For the typical skipper not living in boat-year-round territory, that’s 10 years, maybe more. Read the calendar, not the hour meter. Technology means new motors are way better than those of just a decade ago. The first four-strokes are under-tech and overweight by today’s standards; modern two-strokes and fours tip the scales about the same, and lighter means faster. Fly-by-wire digital controls are easier to use and offer more features than push-pull cables. Reliability and fuel efficiency? Never been better, although you can buy a lot of gas for what new motors will cost. You have to make that call. But before ordering new motors, there’s one thing you have to do. You can’t have too much bedding on fasteners piercing the transom. Water seeping into the core is never good. Praolini recommends checking the transom before ordering those bigger motors you’ve been drooling over. 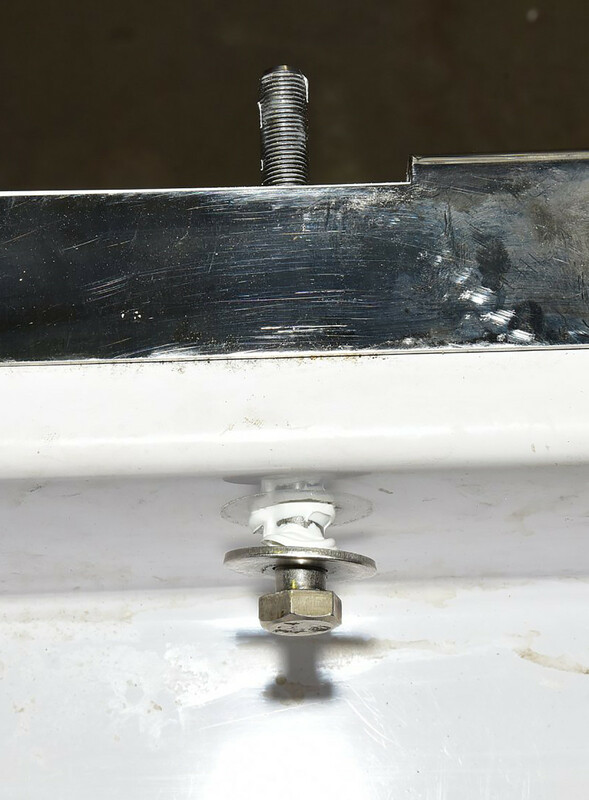 Make sure the transom can take the added weight, thrust and torque. Check for water intrusion, too; most newer boats have high-density foam core in the transom, but older boats might have plywood. 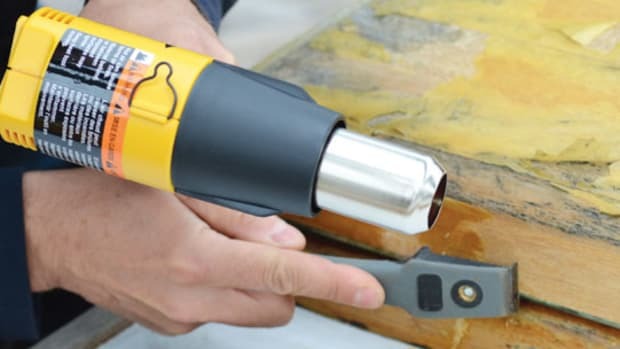 Foam core isn’t damaged by water, but plywood certainly is, and even foam-cored transoms can delaminate, especially if water gets in around the bolt holes. A delaminated laminate should be fixed, no matter what’s under the skins. What about filling the mounting holes in the transom from the old motors? Unless you’re switching from singles to twins, or vice-versa, you won’t have to; the new motors will bolt right into the holes left by the old ones. Since the mid-1980s, the pattern of mounting bolts has been standardized among motor manufacturers. 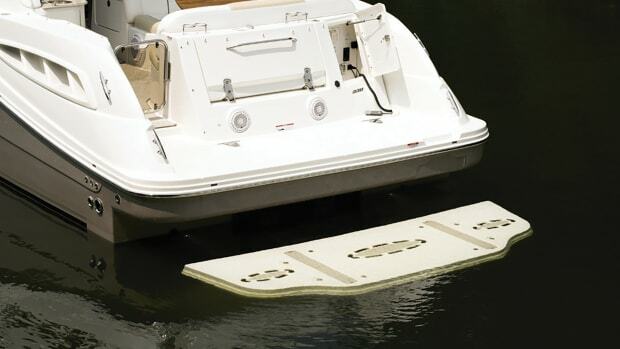 Fender washers inside the transom distribute the strain and provide plenty of surface for bedding compound. With multiple-engine setups, there’s also the question of center-to-center distance between the motors, which varies by manufacturer and horsepower. The 200-hp Mercury four-strokes that Praolini was rigging on an Axopar 28 (a very cool double-stepped V-bottom boat from Finland) when I spoke with him mount on 26-inch centers, minimum. Yamaha four-strokes from 75 to 150 hp also sit at 26 inches, but the 200-hp engine sits on 28.5 inches. Evinrude’s two-stroke E-TECs also vary from 26 to 28 inches. Bottom line is, changing motor brands and/or adding horsepower in multiple-engine setups might mean moving some mounting holes. 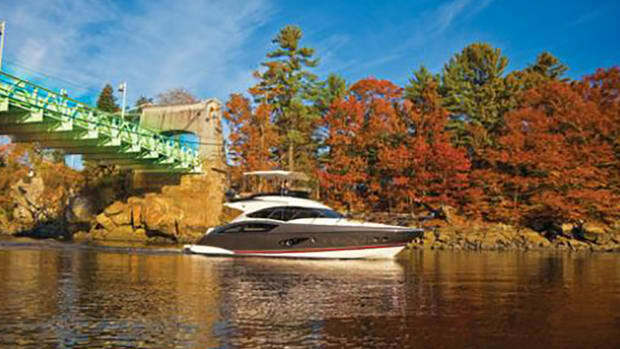 The boatbuilder will often recommend optimum engine separation for best performance, too. 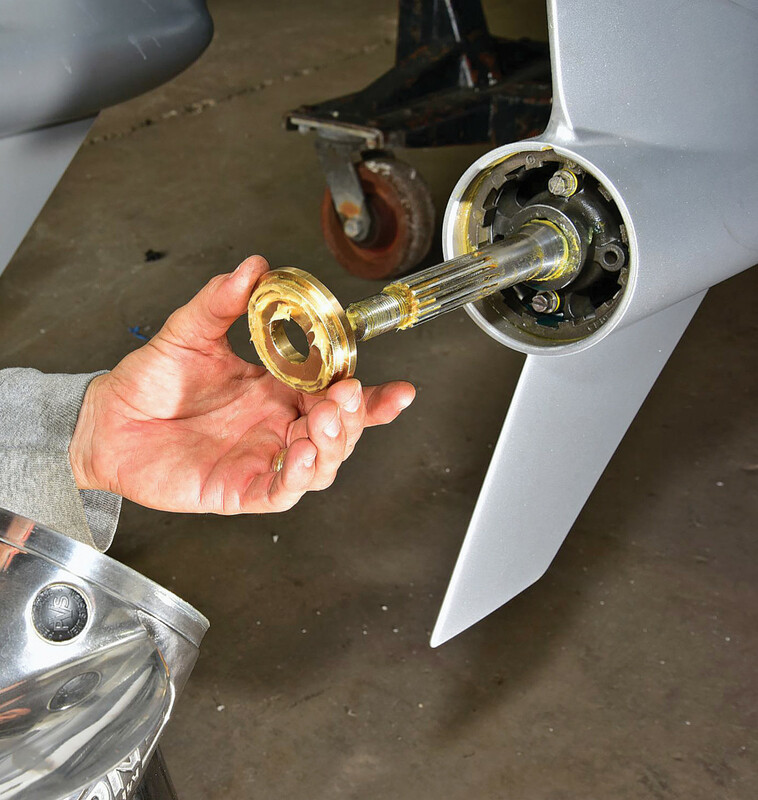 If the transom needs repair the cost, when added to the price of new power, might be enough to tip the scales in favor of buying a new boat with new motors, new systems, new everything else. (Heck, it’s just a payment, and you only live once.) You don’t want to face this decision when your new motors are sitting on the shop floor with the price tags still on them; better to know ahead of time. Although if you decide to buy a new boat instead, I’m fairly sure the dealer will find someone else to buy the motors. At press time, there was a shortage of new outboard motors for sale, and that was across the horsepower range. So if you’re thinking of repowering, allow time to get the new motors. Like most modern outboards, the Mercurys have a digital brain, and can be set up and checked on digitally. Today’s outboard tech has to carry a laptop in the toolbox. It’s human nature to want more and Praolini said that adding horsepower when upgrading has a couple of advantages. Most obvious, the boat goes faster at top end, and everybody wants that. But the real benefit comes at cruise speed. A bigger engine, or engines, don’t work as hard or burn as much fuel to maintain the same cruise speed produced by the older, smaller outboards. The bigger engines generate more horsepower and produce faster cruise speeds when run at their optimum rpm, although they’ll burn more fuel, too. Take your pick. Cruise fuel economy is the number one concern with customers, said Corey Bruno at Mercury Marine. Bruno was the program manager behind the new V-6 four-stroke outboards, a family of naturally aspirated motors built on Mercury’s 3.4-liter platform. Currently rated at 175, 200 and 225 hp, the 3.4Ls were engineered to be lightweight, fuel-efficient and versatile, and calibrated to maximize fuel economy at cruise speeds. At 475 pounds, the new Mercs weigh a bit less than most 200-hp four-cylinder outboards from other builders (Yamaha’s 200-hp inline-four weighs 12 pounds more, for example), and way less than competitive V-6s. The comparable motor from Yamaha, a 3.3L V-6 four-stroke, weighs 608 pounds; Evinrude’s two-stroke 200-hp 3.4L E-TEC G2 weighs 537 pounds. Praolini installed conventional U-Flex single-cylinder hydraulic steering, with a Verado power-steering pump. 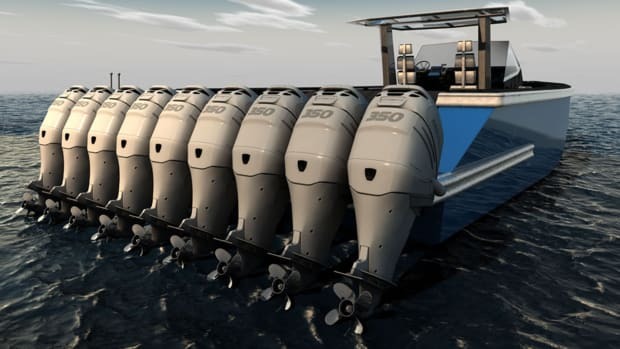 What about upgrading from a big single outboard to smaller twins when repowering? Is it really an upgrade? It adds complexity and cost without a lot of upside, at least in my opinion. Modern outboards are extremely reliable, so the redundancy of twins isn’t as necessary any more; the old days of figuring on at least one engine breaking down whenever you left the marina are over. 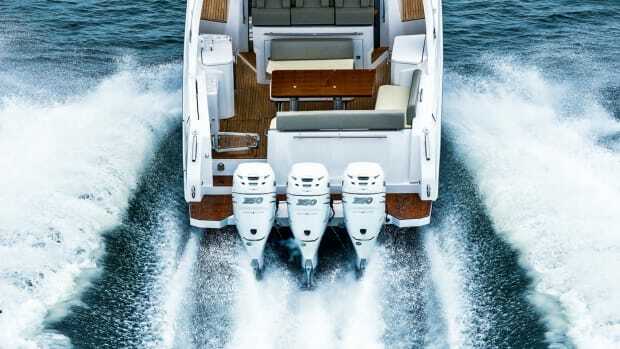 And while twin-screw inboards make maneuvering much easier, it doesn’t work as well with closely spaced outboards; the leverage just isn’t there. That’s why joystick controls are so popular, although they also come at a cost. And there’s the weight issue. Two motors weigh more than one and planing boats perform better when they’re lighter. The lightweight Mercs mitigated the weight penalty somewhat; that’s one of their big advantages. Typical power for the Axopar with a single engine would be Yamaha’s 5.3L, 350-hp V-8 four-stroke, at 780 pounds or Mercury’s supercharged 350 Verado, an inline six with 2.6-liter displacement at about 670 pounds. The pair of Mercurys weigh 950 pounds, or 280 pounds more than the Verado. The twins add underwater drag versus a single engine, which costs a bit of speed, but Mercury tested an Axopar like this one at Lake X with the same twin Mercurys and the performance and fuel economy were both excellent. Top speed was 48.5 knots at 1.75 mpg; best cruise was at 3000 rpm—23.3 knots, 3.05 mpg. Cracking the throttle to 3500 rpm boosted speed to 29.1 knots and 2.99 mpg. 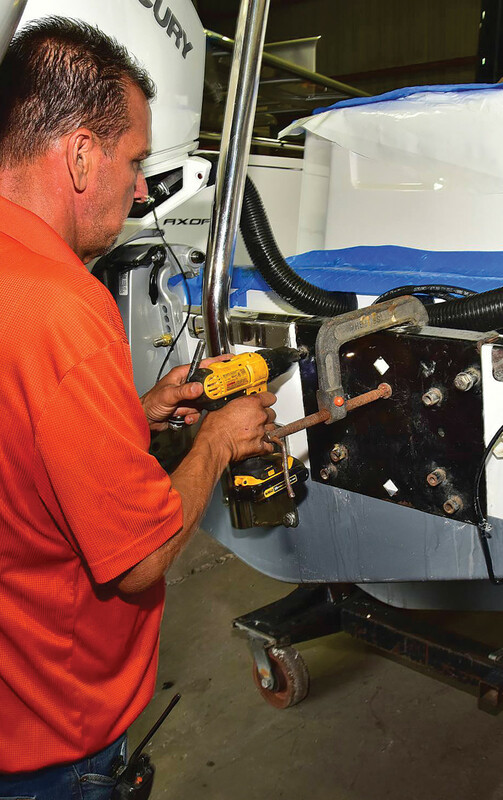 Tighten the bolts, then tighten them again: High-torque outboards put a lot of strain on the mounting bolts. You’d think anyone investing in a repower would want new digital controls, but despite their advantages, some folks like their old push/pull cables. Mercury will adapt the 200 to handle them by installing a servo unit under the powerhead that converts the push and pull of shift and throttle to digital signals that the motor’s electronic brain can process. Bruno said that control was a lot smoother with this setup than with conventional cables. And while it’s a good option for some people, he recommended that anyone investing in a repower check out digital throttle and shift; it doesn’t add that much cost for its advantages. 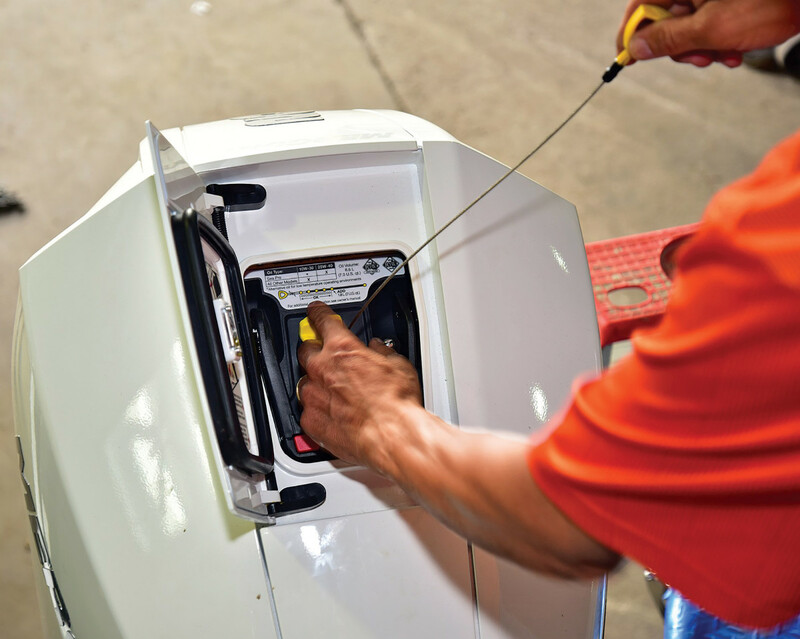 One feature of the new Mercury 200s is oil check/fill access through a service door in the top of the cowling. The Mercurys also have Adaptive Speed Control, which automatically senses load and speed, and maintains engine rpm as the load changes. It’s standard. 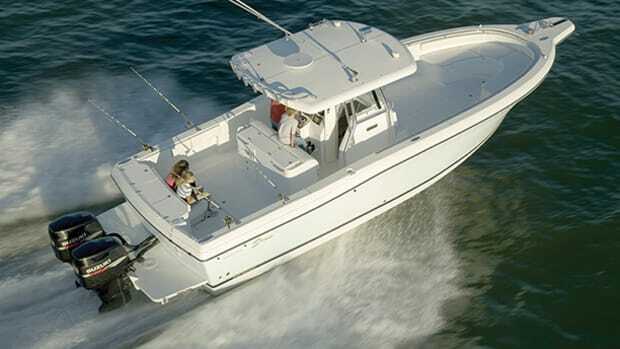 Active Trim is optional, but, according to Bruno, “is more accurate than almost any boater” at trimming the boat for optimal performance, based on a number of inputs. Other manufacturers have similar features in their outboards. Some new outboards require proprietary steering. Evinrude E-TECs, for example, have their steering system integrated into the mounting bracket for a neat installation. It’s standard. 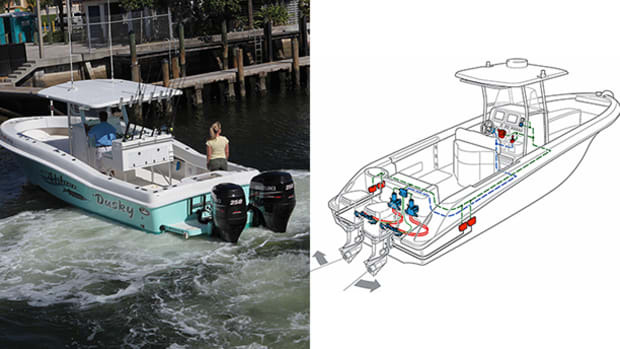 Other manufacturers use other systems, but the Mercurys can handle conventional hydraulic, the setup already on many boats. Praolini installed U-Flex steering on the Axopar, with a single external cylinder and a tie bar between the engines. He upgraded it to power steering with a Verado pump. The last step is installing the prop on a well-greased shaft. Motor, steering, controls— that about covers it, right? Not when Praolini’s on the case. He made several more recommendations based on his own repowering practices. First, he said, take a fuel sample and have it tested. Maybe the tanks have to be pumped out and cleaned. He always replaces the fuel lines, too, from the tanks to the motors. Bruno recommended installing a good-quality external fuel filter to supplement the motor’s onboard filter. “Don’t skimp on this,” he said. Check the battery switches and cables. It’s better to replace them, but at least clean off any corrosion. And since digital engines are very voltage-dependent, install new batteries of the type recommended by the engine builder. Voltage issues will scramble the motor’s digital brains. Mercury specifies AGM batteries; Bruno recommended installing an isolator or automatic charging relay, and a clean power harness. “Ask your rigger about this,” he said. I suspect Praolini is something of a fussbudget, and I’ll bet that’s why his customers keep coming back for more outboard motors. If the Grim Reaper’s taking an interest in your outboard motors, you need a guy like him.